For software that appeals to a wide audience like EA's latest sim game Spore, it's sometimes the first time the average person gets a good taste of how digital rights management (DRM) puts the screw on legitimate users. Spore's DRM limits customers to only three activations after the game is installed. That number isn't restored even if the game is uninstalled. Three is what you get unless you call up Electronic Arts customer support and give them your sob story. While the restriction may not seem terrible at first blush — consider wanting to install the game at a later date. Consider a computer malfunction that forces the user to wipe their box clean. Consider making room on a hard-drive. There's plenty of legitimate reasons why a paying customer may need (or simply choose to) install the game multiple times as time goes by. The theory behind EA's SecuROM DRM (also used in Mass Effect) is that it combats piracy by keeping file sharers from reusing activation codes. That lasted almost a full day after Spore debuted in Australia, September 4. Spore's DRM being almost instantly cracked was a matter of routine for modern PC games. Now pirates can install Spore to their heart's content while paying customers unwilling to get a cracked version are stuck with the restrictions. Clearly people are mad as hell. But will we take it anymore? 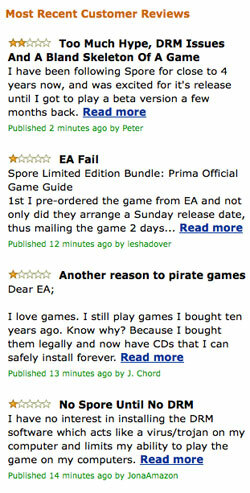 Presently at Amazon.com, Spore has only a one-star user rating. Mostly, this isn't about the quality of the game, which is for another discussion entirely. It's about the DRM restrictions. Shenanigans from a flash internet mob? Maybe. But the score is a result of 1,662 one-star ratings out of a total of 1,797. Most of the reviews wax dramatic, such as reviewers claiming the DRM is a "travesty" that ruined the game entirely, or labeling it a "virus." The legitimacy and appropriateness of the volume of outrage on Amazon may be debatable, but its clearly not good news for EA's PR department. EA has recently been attempting to change its image in the gaming community from a project-killing developer sweatshop to something more positive — but this happening to what it surely expected to be a video game blockbuster is doing it no favors.